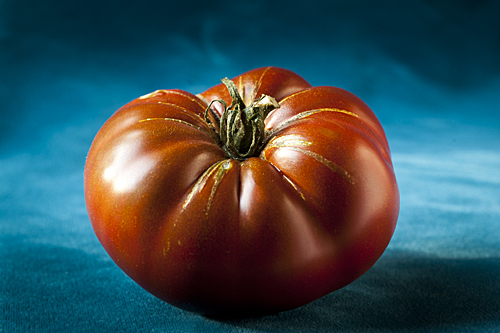 Cherokee Chocolate – Tomato Town organically grows heirloom tomatoes in the greater Kansas City area as well as Johnson County, Leawood, Lenexa, Olathe, Shawnee, Merriam KS, Independence MO and Kansas City Missouri, KCMO. Varieties include: Cherokee Purple, Brandywine, Stupice, Carbon, Black Krim, Black Cherry, Yellow Pear, Absinthe and Aunt Ruby’s German Green. We are avid fans of Cherokee Purple, a relative of this chocolate cousin. In fact, it was the Cherokee Purple that started us on this heirloom adventure. So we had to discover for ourselves what made the chocolate different. Certainly, this year we have enjoyed the flavor explosion of both varieties. But other garden forums had claimed that the Chocolate variety was more prolific and yielded fruit earlier. Here in TomatoTown, we have not found either to be the case. Although, as we have mentioned before, this is no year to make broad, sweeping conclusions about any variety grown in our little garden oasis. Recently, Cherokee Chocolate made it into the top 25 best-tasting varieties at the 2011 KCTT Tomato Tasting. This entry was posted on Monday, August 15th, 2011 at 5:42 am. It is filed under Varieties. You can follow any responses to this entry through the RSS 2.0 feed.